Have questions about how large we can print your digital photograph? Click HERE for our Printing FAQ! We look at each image carefully and our graphics specialists will crop, resize, and make minor contrast and color adjustments at no additional charge. We offer a 20% printing discount for printing that is framed at our shop. We offer quick printing turnaround. Bring us your high-resolution digital image on your camera, flash drive, CD, or DVD. Choose your paper: EPSON® Enhanced Matt, EPSON® Premium Luster, 100% Cotton Rag, or EPSON® Premium Canvas. Questions? Send us an e-mail and we will be happy to answer your questions. You may also call us and ask for Mike, Kirstie, or Paris for details on our printing program. NOTE: EPSON® states that: "Actual print stability and longevity will vary according to image, display conditions, light intensity, humidity, atmospheric conditions, inks, and post-printing treatments. Epson does not guarantee stability or longevity. For maximum print life, display all prints under glass or lamination or properly store them." 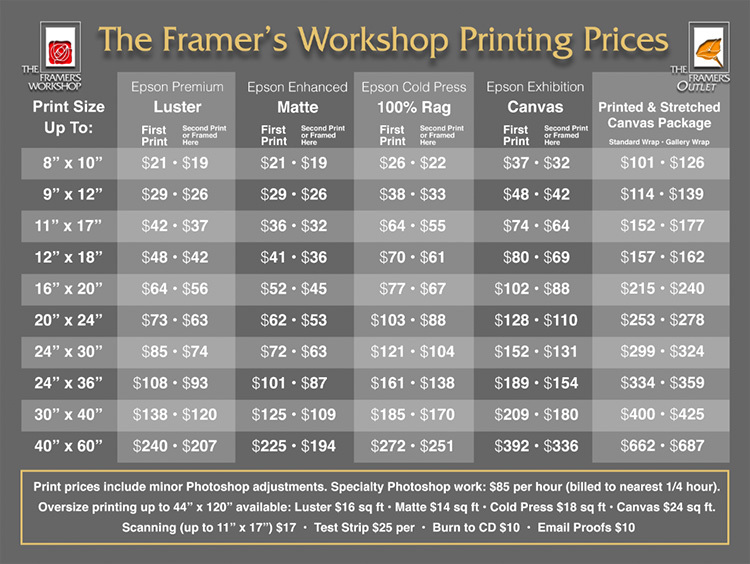 The Framer's Workshop recomends framing all digital ink-jet prints with UV filtering glass as well as acid free matting and backing to help preserve the longevity of the print. Regarding printed canvas, EPSON® states: "Required Overcoating: As with any Fine Art Canvas designed for indoor only usage, Epson canvas must be overcoated with a protective spray or laminate. Do not display in damp or humid conditions unless thoroughly coated, front and back, with a high quality solvent based liquid or spray overcoating. Overcoating will change print characteristics which may include color, gamut, gloss levels, and other visual characteristics. Overcoating may also accelerate yellowing." 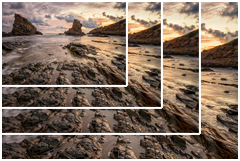 Whether you have a simple digital photo for printing and enlargement, need custom design services, or want to reproduce your art in a large format for framing resale, we can provide professional results at very competitive prices. We offer a 20% printing discount when you frame your printing with us. We also offer corporate printing and framing services. Let us help your company print and frame custom images, photographs, posters, legal trial presentation displays, architectural drawings, signs, or other graphics for your office or business promotions. Need it fast? We can print on short deadlines. Send us your file and we can print and mount print-ready images for trial graphics illustrations and presentations, architectural and interior design presentations, retail signs and posters, medical posters, meetings, and conferences often on the same day. Delivery service is available. See our Corporate Framing Page for more details. EPSON® Enhanced Matte, a non-archival paper which works very well for matte-finish photography. EPSON® Cold Press Bright, an acid free, 100% cotton rag media with a bright textured finish. This paper has an extremely-high color gamut and black density. EPSON® Premium Canvas Matte, a heavy, water-resistant, high-resolution cotton-poly blend for outstanding reproduction quality and durability.